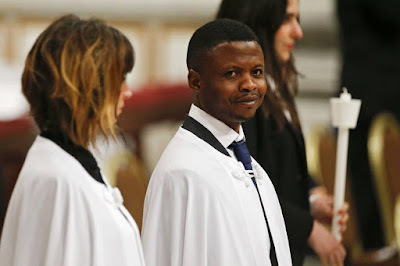 A Nigerian who migrated to Italy has been hailed as a hero and had his head baptized by head of the Catholic church, Pope Francis. Tens of thousands of pilgrims gathered in St. Peter's Square on Sunday for an Easter mass led by Pope Francis, who on the previous night, baptized eight people, including a man known in Italy as the "migrant hero." Nigerian John Francesco Ogah, 31, was praised after he intercepted another man attempting to rob a supermarket in Rome's Centocelle neighbourhood on Sept. 26, 2017. According to Italian news reports, Ogah had been begging for spare change outside the Carrefour market when a masked thief, armed with a meat cleaver, tried to make off with 400 euros ($636 Cdn) he had stolen from the cashiers. Security cameras captured Ogah's courageous next steps: With nothing more than his bare hands, he confronted the thief, wrested the cleaver away and held him by the collar until police arrived, after the man fell from his attempted getaway motorcycle. Ogah, who did not have permission to stay in Italy, then left the scene, fearing it would be discovered he did not have documents, according to La Repubblica newspaper. Police using footage from the surveillance cameras tracked him down and rewarded him by helping him get legal permission to stay in the country. The police captain who worked in the neighbourhood stood at Ogah's side as his godfather during Saturday night's baptism. The faithful attending Sunday's service underwent heavy security checks to enter St. Peter's Square. Pope Francis opened the festivities with a Tweet to his global flock: "Our faith is born on Easter morning: Jesus is alive!" He then delivered his "Urbi et Orbi" message ("to the city and the world")message from the central balcony of St. Peter's Basilica. Francis called for peace in a world marked by war and conflict, "beginning with the beloved and long-suffering land of Syria," and extending to the entire Middle East, the Korean peninsula and parts of Africa affected by "hunger, endemic conflicts and terrorism." The Pope reflected on the power of Christianity's core belief — that Jesus rose from the dead following the crucifixion. The pontiff said the message of the resurrection offers hope in a world "marked by so many acts of injustice and violence." "It bears fruits of hope and dignity where there are deprivation and exclusion, hunger and unemployment; where there are migrants and refugees, so often rejected by today's culture of waste, and victims of the drug trade, human trafficking and contemporary forms of slavery," the Pope said. He called for a "swift end" to carnage in Syria, demanding that aid be delivered to the needy there and calling for "fitting conditions for the returned and the displaced." The Pope also urged reconciliation in Israel and hoped that mutual respect would "prevail over divisions" in Yemen and the entire Middle East.